Jamie Says: Baseball and Football and Basketball, OH MY! Baseball and Football and Basketball, OH MY! This weekend was a busy one, with not much time to spare for blogage. Alex had two football games abd Ash had three Basketball games. Aside from all the running around, we managed to do a little Geocaching at lake Georgetown and even hung out around the pool a little in between games. We are looking forward to all the fun the new pool will provide this summer! It's right around the corner. 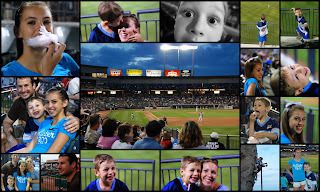 Here are some pics of our trip to the Dell Diamond on Thursday. We had a really nice time, and the weather could not have been anymore perfect! Click to enlarge.